Panorama 24 is the stone-viewing conclusion of our Stonehenge Decipherment Perambulation, a counter-clockwise tour in which we have identified the stars represented by the sarsens and stones of Stonehenge. 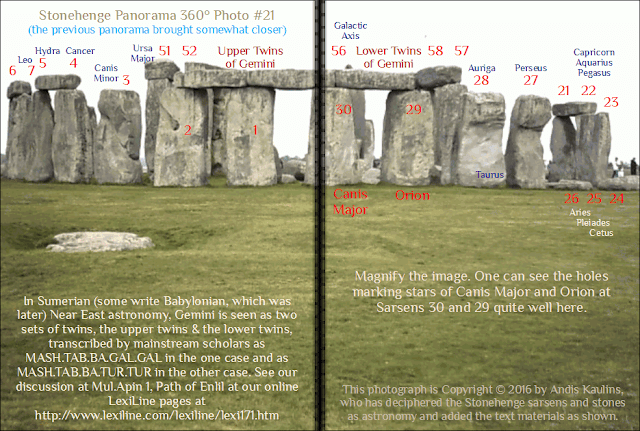 More proofs follow through analysis of individual stones of Stonehenge, including a stone that marks M6 and M7 near the Galactic Center. At the New York Times, Adam Liptak in Supreme Court to Hear Samsung Appeal on Apple Patent Award already wrote in March describing the case of Samsung Electronics Co. Ltd., et al. v. Apple Inc., No. 15-777, U.S. Supreme Court. This past week the U.S. Supreme Court heard oral arguments on the case -- see transcript and audio. SCOTUSblog has a page on the progress of the case. The core legal issue in the case is the question of how judicial damage awards for the infringement of design patents should be calculated. The present and totally absurd judicial practice is to award damages based on all profits realized from sale of an infringing product, even if the design of the product, as in the case of a smartphone, has nothing to do with the actual inside workings of the product. Moreover, all electronics manufactured in our modern world today are subject to an octopus-like patent law mess created by incompetent judges in courts such as the Federal Circuit and by equally incompetent legislators in places such as the "McClunker and Ghastly" Congress, where selfish partisan politics is the only thing that counts and where law and country are distant secondary matters. Any electronics product sold today is generally subject to literally thousands of patents. See e.g. Mike Masnick at TechDirt in Meet The Patent Thicket: Who's Suing Who For Smartphone Patents, and that was in 2010! How much worse have things become in the interim while the "do nothings" in Congress and elsewhere in places such as idling federal agencies collect their paychecks. In any case, awarding ALL profits as "damages" to some patent windfall-seeking complainant under such circumstances is just legal and judicial idiocy. "It seems to me that the design is applied to the exterior case of the phone. It's not applied to ... all the chips and wires ... So there ... shouldn't be profits awarded based on the entire ... price of the phone." All the rest of the argumentation is just a bunch of handwaving by people seeking to rake in windfall profits based on the "deplorable" state of the patent law. A small thin, flat smartphone screen in rectangular form and with rounded edges is, at best, only "minimalist" design, if that, and is even so marketed -- which does not exclude its greedy producers from asking for "maximalist" damages, laughing all the way to the bank and smirking behind the scenes at the gullibles who swallow such vapid patenting nonsense in an era when people should be doing something sensible, rather than becoming rich through erroneous and absurd law-created windfall profits via patent damage suits. NOTICE: There are THREE images in this posting so make sure you view them all. If you want to experience the thrill of decipherment work, look only at the first two images and try your hand at doing what we have done -- our full DECIPHERMENT SOLUTION is found in the third image. 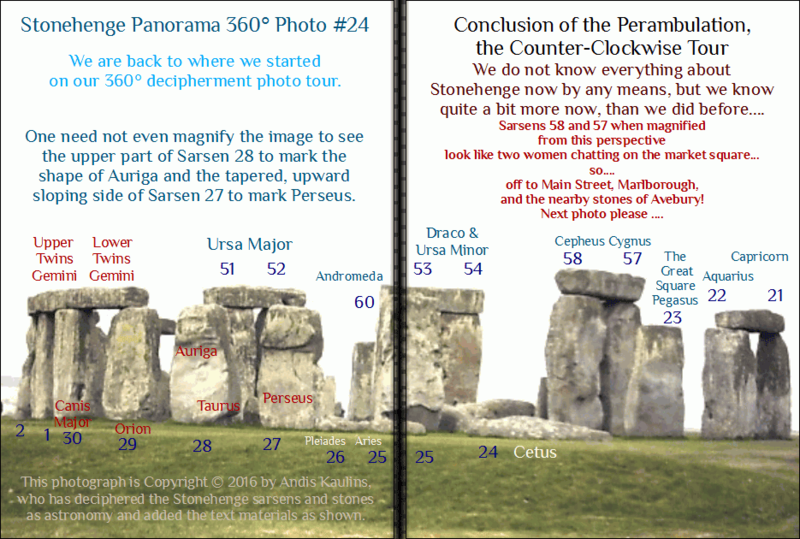 If we now turn around at this point in our tour and look away from the inner henge of Stonehenge outward, we find ourselves face-to-face with the so-called "Heel Stone" ... the most famous of all the stones at Stonehenge. 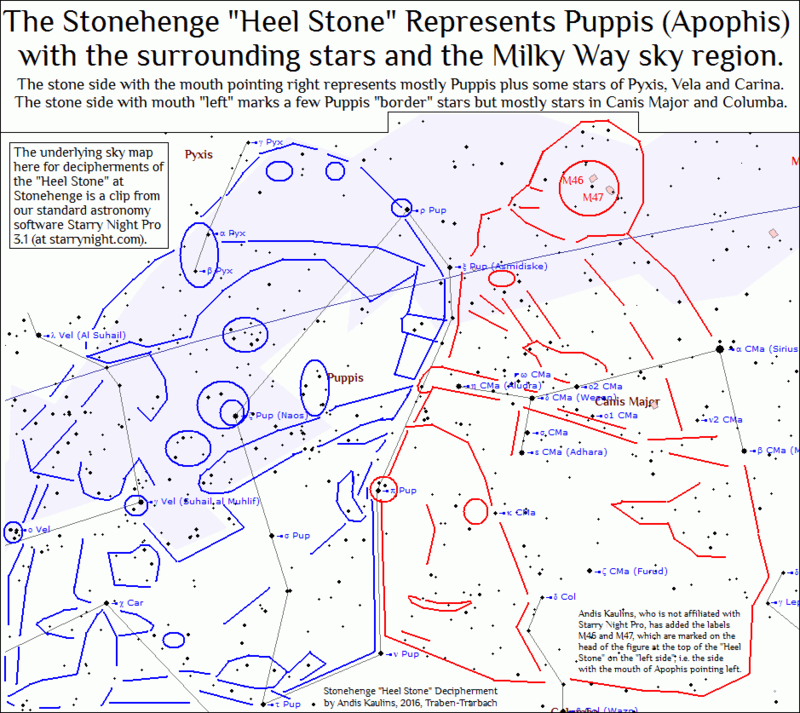 If our decipherment of Stonehenge is correct and we have done our homework properly up to this juncture, the Heel Stone can only represent stars of Puppis and/or its surrounding stars in that "galactic" Milky Way region. 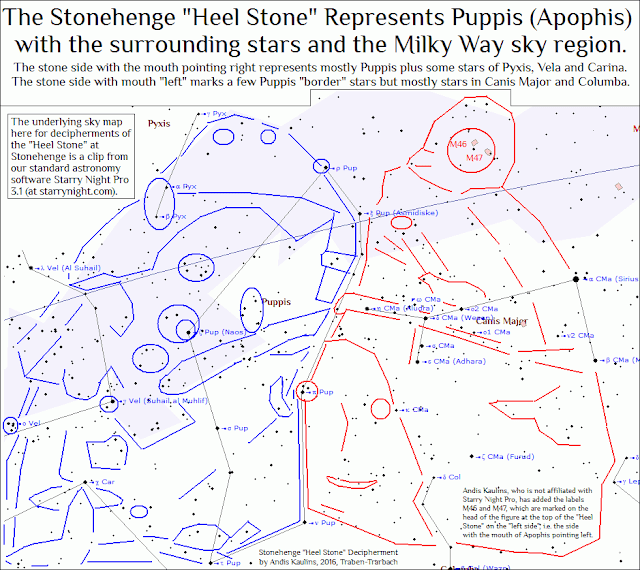 It turns out in fact according to our analysis that each side of the Heel Stone represents neighboring stars in that Puppis sky section, so that one side of the Heel Stone meshes perfectly with the other in portraying two directly neighboring sections of the heavens. 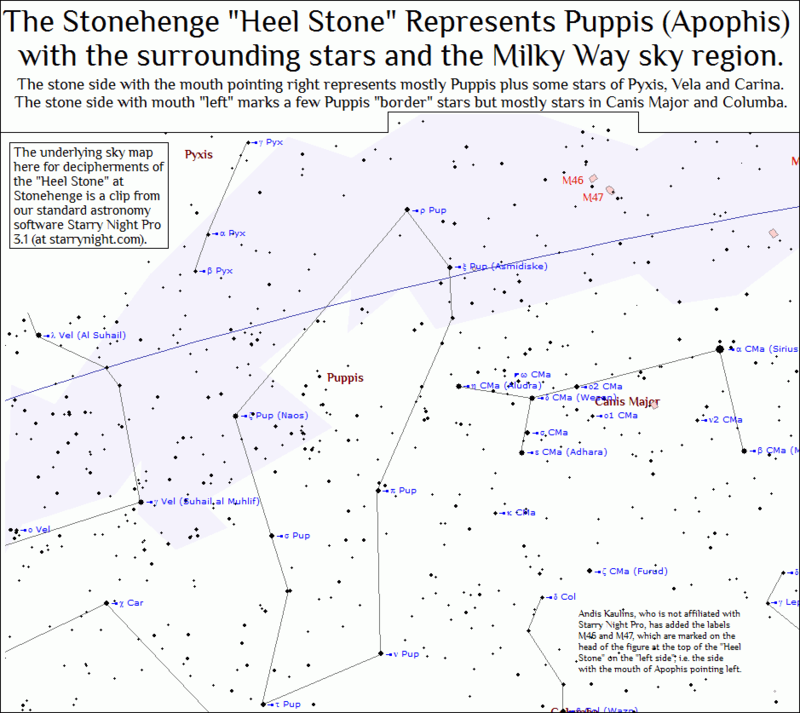 The "Heel Stone" side with the large incised "mouth" of Apophis pointing to the right marks the stars of Puppis, plus some stars we today assign to the constellations Pyxis, Vela and Carina. The "Heel Stone" side with the large incised "mouth" of Apophis pointing to the left represents a few stars we today place on the border of Puppis, but mostly stars in Canis Major and Columba. It is really incredible after these thousands of years and after the damage done to these stones by wind, weather, and humanity, that so much can still be recovered through the use of modern photography and imaging software. Both sides of the Heel Stone have figures carved upon them, most prominent being the large-mouthed Apophis, represented by the entire stone as the galactic underworld "Nessie" that in ancient lore consumed the deceased. 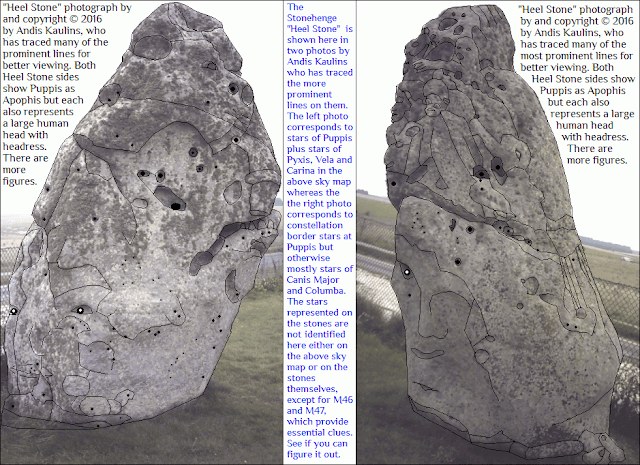 We already found Apophis pictured on Stone #10 at Avebury, so that this ancient belief is tradition, also at Stonehenge, prior to the Christian era. Each stone also represents a different human head, wearing a headdress. 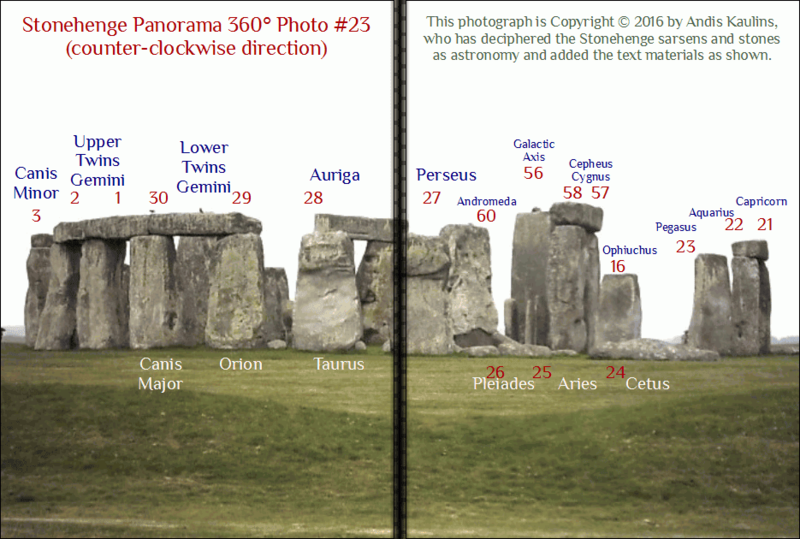 There are other figures on the stone as well, in our opinion, but nothing is gained for the present time by drawing attention to them as we must at this stage in the decipherment process stick to the essentials only. 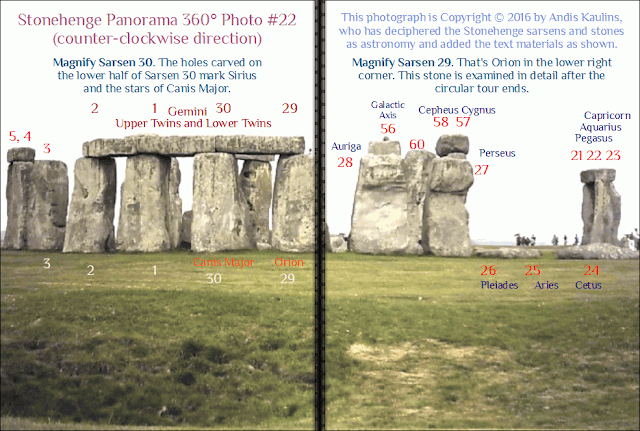 These three images consisting of photographs and the accompanying tracings and text explanations are all Copyright © 2016 by Andis Kaulins, except of course for the essential underlying sky map from the astronomy software Starry Night Pro 3.1 which is of course copyrighted by Starry Night. Enjoy! Click on the images below to obtain the larger original images. These original images can then be further enlarged by pressing the keyboard Control plus the + sign.